Hi everyone! We are The Matsuda's and we are humbled and honored to be chosen as PDD's Family of the Month for February 2019! Close to retirement Dance Dad Ryan has worked for The City & County of Honolulu for the past 27 years. Dance Mom Randi has worked for Hawaii Pacific Health for the last 19 years. And Dancer Rylee has been dancing at Pas De Deux Hawaii for 7 years and is a thriving 8th grader at Hanalani Schools in Mililani! At the age of 6 Rylee started cheerleading for The Ewa Beach Hammerheads Football Team. Shortly after the season ended she wanted to expand and try her hand at dance. At the age of 7 we enrolled her in Jazz and Hip Hop Under the direction of Ms. Allicia & Mr. Erick! As her dance instructors cultivated and nurtured her passion for dance she challenged herself by adding on ballet with Ms. Annri! A few years later she felt ready to try competitive dancing. At the age of 10 she tried out and earned a spot on the exclusive competitive team at PDD. She and her teammates competed and went on to win multiple awards and scholarships at Spotlight Dance Cup and Jump competitions in Honolulu! In 2017 Rylee and her team traveled to Las Vegas to compete in Nationals at The Dance Awards where one of Rylee's group numbers placed 3rd! Currently she in training and preparing for 3 upcoming competitions to include Nationals in Las Vegas once again. Over the years Rylee has had the amazing opportunity of having been trained also by Mr. Philip, Mr. Jere and Ms. Chandler. Rylee credits all of her dance instructors (past and present) for her successes in dance and in life! During her free time, Rylee enjoys playing basketball and hanging out with her dance sisters! For all new and potential dance families I say WELCOME! They say it takes a village to raise your children and we here at PDD are one awesome village, come see for yourselves!! Along with becoming an award winning dancer, dancing has taught Rylee to be a team player, to staying healthy and fit, to maintain good grades, time management, responsibility, to be humble in winning and gracious in defeat and to know that hard work pays off. The sister and brotherhood of the dancers are unlike no other. Many of Rylee's best friendships were made right here in the studio. Ryan and I also have been blessed with friendships that will last a lifetime with other dance families! 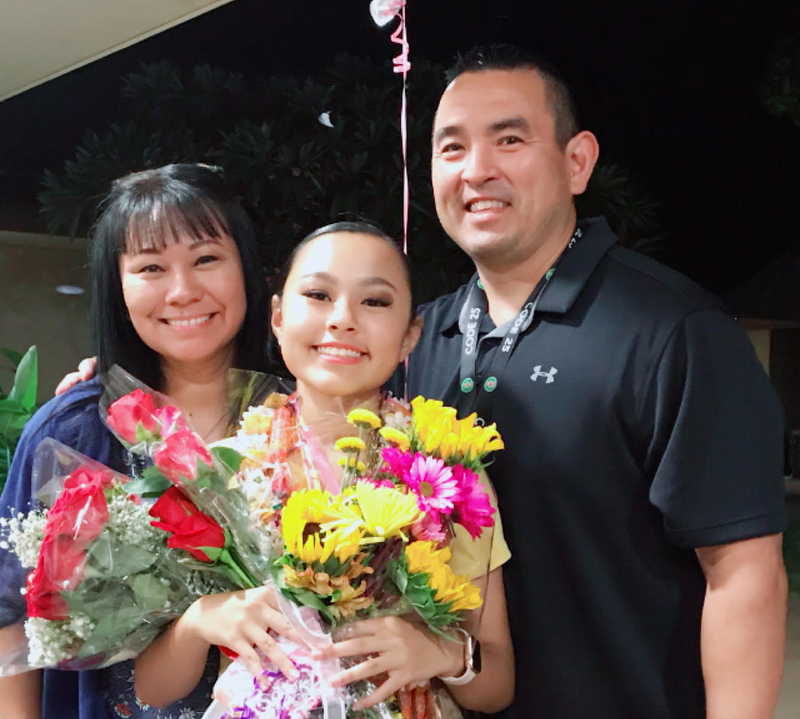 With 7 years of dance under her belt Rylee looks forward to many more years of guidance and instruction on her dance journey under the leadership at Pas De Deux Hawaii! From a grateful heart, much appreciation goes out to the the staff and to Owners Wendy & Jeremy Gilbert for creating and providing a safe and educational environment for Rylee to continue her love of dance!